EPISODE SIXTEEN, SEASON THREE- "PARADISE LOST"
Hive calls the inner circle of HYDRA together. S.H.I.E.L.D. is hot on the trail of Gideon Malick and HYDRA. Daisy Johnson finds out a shocking revelation about Lincoln. 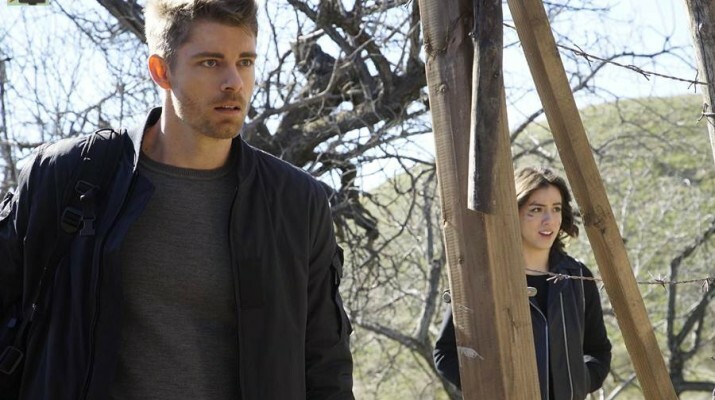 Lots of stuff went down on tonight's episode of "Agents of S.H.I.E.L.D." There was a lot to like and some stuff that was a little weird. Hive made it clear that he plans to be the leader of HYDRA. He made it known to Gideon that he has him by the balls. If anybody was expecting Gideon's daughter Stephanie to become the Madame Hydra in this universe, well those theories got shot down quick. Hive killed Stephanie rather quickly tonight. The episode wrapped around a series of flashbacks to the early days of Gideon rising in HYDRA. Gideon had a brother named Nate, and they firmly believed in the Inhuman god trapped on the planet Maveth. The brothers participated in the ceremonies choosing somebody to try and bring back Hive. The brothers made a pact to never go to Maveth, but since Hive has the ability to absorb the life force out of people to keep his life going, Gideon took back his oath and his brother went to Maveth. Gideon never told his daughter, so Hive told her for him. How did Nate go to Maveth? Well, that's never fully explained. It has something to do with a Survivor-style drawing of rocks. If you have a black rock, your good to stay home. If you draw a white rock, you go to Maveth. The men are given rocks to put into the bag, I think at least. This part of the story moves rather quickly, and if you blink, you may miss a detail. Its sad because this is really important. Because Hive has a grudge against Gideon because he basically through his brother under the bus by not throwing his colored rock into a pond. At least, that is what we are made to believe. Its hard to tell. Its also hardly explained why Hive feels the need to get revenge on Gideon if Hive isn't Nate, he just has Nate's memories. To gain his control? I am not quite sure. We also find out that Hive is most definitely the Hive we know from the comics, but we don't get a good look at his face. But he does have the tentacles. S.H.I.E.L.D. is trying to find out everything they can about Ward and how he resurfaced. Coulson knows he killed him on Maveth, yet Ward is alive and well. The team captures Giyera, which leads to fight between May and Giyera. Which, let me tell you, was the highlight of the episode. Sadly, it doesn't help. Giyera takes control of the Quinjet and successfully lands it in the hands of HYDRA. Coulson, Mack, May, Fritz and Jemma all get captured. Meanwhile, Daisy and Lincoln go to talk to an Australian who has some special information about Hive, which may help S.H.I.E.L.D. later on. Apparently this Australian knows Lincoln. He and Lincoln went to the Inhuman haven from last season, and the Australian ended up not being an Inhuman. But he remembers Gordon and Daisy's mother and the Afterlife. He also lets it slip about Lincoln's past. Apparently, he had a bad past with alcohol. So I guess we will get the "Demon In The Bottle" storyline, just it won't star Tony Stark, but Lincoln Campbell. All jokes aside, it was pretty awesome when Daisy and Lincoln decide to assemble the Secret Warriors to go save Coulson's team from HYDRA. I kind of hate how this show has been teasing the Secret Warriors the way "Game of Thrones" teases things, but next week should be awesome. I liked the fight between May and Giyera. Seeing Daniel Whitehall again in a flashback was cool, but Gideon's past was handled kind of sloppily.